How would you feel if you encountered a rat almost three feet long? Smithsonian's Dr. Kristofer Helgen was overjoyed. The rat was discovered by Kris and other members of a BBC expedition team. 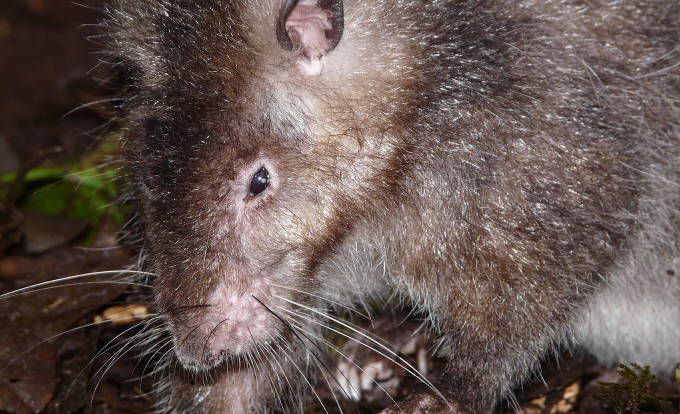 The rat was in a remote volcano in Papua New Guinea. They named it the Bosavi woolly rat. 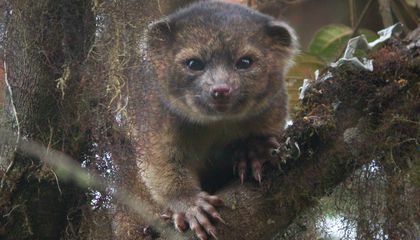 The name came from the animal's thick fur and its home on Mount Bosavi. The Bosavi woolly rat has yet to receive its scientific name. Scientific naming reflects how an organism is classified in the tree of life. Biologists are still sorting it out for this rat. They do know that it belongs in the same family as our common city black rats and Norway rats. That family is called the Muridae. They also know that it belongs in the genus Mallomys. It is a group that includes other oversized rats. Its unique identifier, the species name, has yet to be announced. What makes something a species? This can be a surprisingly hard question to answer. Many scientists think of a species as a group of living organisms that can reproduce and pass genes on to the next generation. Historically, scientists identified species by the way animals looked (their morphology). They also identified them by how they behaved. The scientists sorted them into categories based on things like arrangement of teeth and diet. Species were sometimes misclassified if they looked similar. Sometimes the species were actually from different evolutionary lines. Modern classification of species goes deeper to include other types of evidence, such as genetics. Genetics reveal evolutionary relationships. Scientists analyze DNA. It allows them to determine how closely related an organism is to other, similar organisms. And it helps tell them where it fits into the evolutionary tree. Finding and classifying new species gets us closer to understanding the invaluable biodiversity of Earth. There is more biodiversity to discover, even for mammals. Kris Helgen has discovered about 100 new species. He is always on the lookout for more. See how he does it in a live "Smithsonian Science How" webcast. It airs on Thursday, April 28, 2016. It is titled, How to Discover New Mammal Species. You can watch it at 11 a.m. and 2 p.m. EDT on the Q?rius website. Kris will discuss and answer questions from the National Museum of Natural History. Get teaching resources to use with the webcast. Why was Dr. Kristofer Helgen happy to see a giant rat? He was happy because he new it was a new species and he wanted to do some research and discover more species. Nice usage of the text. It was good and straight to the point. He was happy to see the giant rat because he didn't know what it was. Dr.Kristofer Helgen was happy to see a giant rat becuase that was a first time seeing a diffrent looking rat. Dr. Kristofer Helgen was happy to see a giant rat because it was a new species. I think Dr. Kristofer Helgen was happy to see a giant rat because he new that he most likely discovered a new species. Dr.Kristofer Helgan happy to see a giant eat because he discovered almost 100 new mammles. Also because he loved doing it and he wanted more. I think Dr.Kris was happy to see a Giant Wooly Rat because he wanted to do research and find more information about the Giant Wooly Rat. That is why I think Dr. Kris was happy to find a Giant Wooly Rat. I think Dr. Kristofer helgen was happy to see a giant rat because he liked finding new species and he named the rat. Dr. Kristofer Helgen was overjoyed to see the giant rat because it would help people understand how rats evolved.